Yesterday afternoon I was sitting with a group of gringoes from Port Orange Presbyterian Church in Florida. We have been working together this past week building relationships with the congregation of Iglesia Presbiteriana Emanuel. When the minivan or "combi" had come to take us back down the hill to the center of Ayacucho, Sara signaled to us that it was time to start saying goodbye. I was sitting on a bench with Mama Gregoria and her four daughters. 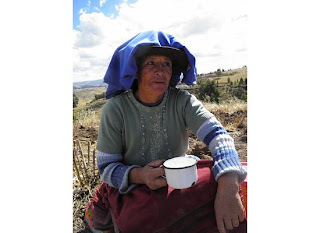 That is when Sebedina, a normally reserved and quiet Quechua woman jumped into my lap and said "You cannot go. I will not let you." Needless to say this unexpected display of devotion, and proof of the fruits of my year long laborial efforts at relationship building in Cuchipampa had paid off. Pf course mama Gregoria jumped in, not my lap, but held my shoulders down and said "When you leave who are we going laugh with (more like at hee hee!) and talk with? Don't go, you can't. You haven't even had lunch at my house yet." 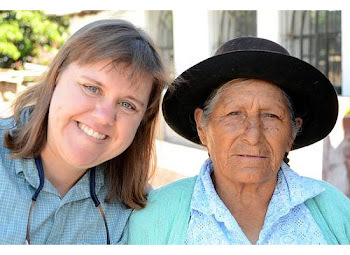 So this Friday I am having lunch at Mama Gregoria's house and on Thursday July 21st I am leaving Ayacucho. These next two weeks will be full of "Goodbyes for now" so I thought I would take some time to reflect on a few of the things that I have seen and done while here in Peru. For better or for worse. 1. Witnessed the thin places where Quechua (indigenous Peru) and Spanish culture intersect and meld, as well as intersect and bounce off one another. Food, music, spirituality, dress, language, and simply ways of being. 2. Potatoes - anyway you slice them I have eaten my share this year because a plate is not a plate in Peru unless there is potatoes and white rice on them. They are an Andean staple. 3. Having a typically reserved Quechua woman sit on me to keep me from leaving. 4. Pacha Manca - Andean BBQ. We made it in my backyard. Everything is buried in the earth with hot rocks and left to cook for two hours. Peel it back and eat with you hands. I was told it tastes better that way. 5. Walking alongside of the victims of the Internal Conflict that gripped Peru from 1980-2000. Many of whom are still looking for their loved ones or their remains, and a place to begin processing what happened. The majority of whom are Quechua speaking, and did not ask for the conflict in the first place. The Sendero Luminoso brought it, the military answered, and the indigenous mountain populations were caught in the middle. Like being caught between two fires. Here's to Maria Concepcion, Mama Dio, Juanita, Paulina, Don Delfin, Isaac, Elvira, Salome, Rosalbina, Marlene, Flavia, Hilaria, Zenovia, and the rest. 6. Picking potatoes and making authentic Andean Queso with Mama Milchora (My host grandmother) in Remiapata. An Andean sleeping bag is actually a sheepskin rug. 7. Helping the families of Huarapite finally put their loved ones to rest. Walking alongside of them 27 years later as they witnessed the transferral of remains, carrying caskets on the procession from the rural chapel to the new graveyard of 19 graves. Holding Leonora as 27 years of waiting over whelmed her and her sister. 8. Being invited to preach, teach, and do just about what ever my creative heart and mind could think of at Iglesia Presbiteriana Emanuel in Cuchipampa, Ayacucho. Kudos to Pastor Juan S. Quispe for taking a risk (and I think having it become fruitful). What a fantastic church and congregation. Friday Pastor Juan is going to teach me how to celebrate communion in Quechua. 9. Macchu Picchu during its 100th Anniversary year.Enough said. 10. Working alongside of - teaching and learning, with and from - the Paz y Esperanza Ayacucho Team. Honorato, Milagros, Yudy, Felimon, Marcelino, Omar, Neomi, Raul, Henry, and Yuele. Not always a smooth and easy process, but rewarding nonetheless...for both sides I think. 11. Traveling with Sara Armstrong and Rusty Edmonson, mission co-workers, while in Huanta and Ayacucho. 12. The city buses of Ayacucho. Sube Sube, baja baja!! So those are just some of the highlights. I think my blog kind of puts the rest in perspective. So let the countdown begin. This week is full of lunches, pacha mancas (my favorite! ), a pijamada or sleep over with the Emanuel youth, a trip to Huamanquiquia for exhumations, and a trip down the mountain on the Antezana bus line. Adios mi Pueblo Ayacucho!! (It is actually a song). On June 22 Paz y Esperanza went British by opening an office in London, England. This, the newest Paz y Esperanza office makes the international evangelical NGO that works to promote human rights, prevent and combat the abuse and marginalization of women and children as well as make public the atrocities of the internal armed conflict that took place in Peru from 1980-2000, many of which are still "unsolved". The newest Paz y Esperanza Office is a covenant partnership signed by some 80 people who have worked in and are passionate about human rights, the history, culture, and dynamic people of Peru, Bolivia, and Ecuador. 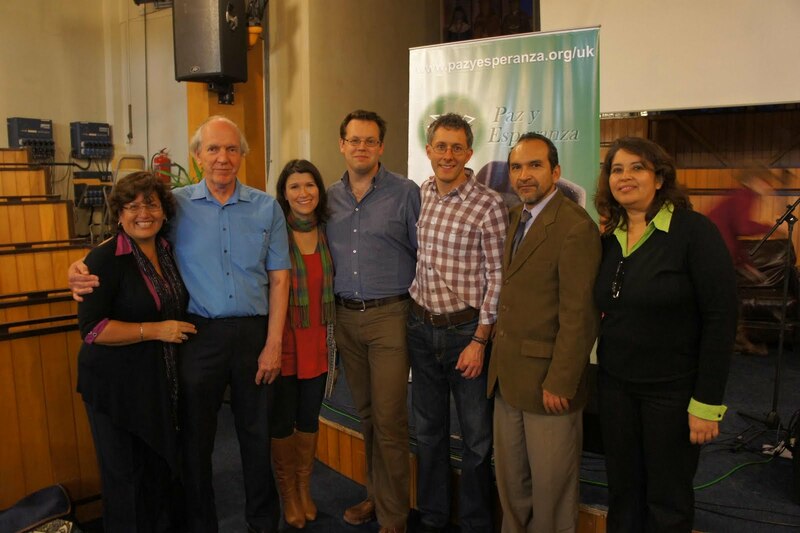 The inauguration of this newest international office of Paz y Esperanza was confirmed in Christ Church and Upton Chapel in London. Graham Gordon, the director of the board, said "Our promise and work will be to promote and bring awareness to the churches of Britain about the human rights situation in Peru, Boliva, and Ecuador." Paz y Esperanza began in Lima, Peru in the 1980's by several lawyers working on human rights violations, but now has multiple regional offices in Peru, as well as international offices in Ecuador, Bolivia, and the United States (Minnesota). Shalom is a state of peace...but wait it is much more than that. It is a state of peace when all things are right in your life; economically, relationally, yes shalom. In Quechua the word they use is Kawsaq (pronounced COW-SAKH). Kawsaq is also the name of the quarterly publication of Paz Y Esperanza here in Peru. The editor is Omar, my companero in communications. Yesterday Milagros and her husband Jose Carlos invited me to attend a "desfile de sapos" in Ayacucho. When I first arrived in Peru I would have said what in the world is a sapo? After having been in Peru for ten months I know that a SAPO is a frog or what the Peruvians call the Volkswagon Beetle (car). In Peru the Sapo is king. They are everywhere. My host family said because they are affordable. They said you can secure one for about 2,000 USD. So Milagros and Jose Carlos have a beige sapo. I kept calling it the SAPO de ORO or the Gold one but Jose told me that when they got it, it was certified as "the Sapo Beige". Sunday morning we all gathered at a local park with some others. They were actually a Sapo Club called the Amigos de Volkswagon Peru or the Friends of the Volkswagon, Peru. Pretty official with stickers and other paraphanalia and even little flags for their SAPOS. Oh! If you see a SAPO you are supposed to say SAPO! and lean over and pinch the person next to you. They couldn't get on board with the "punch buggie!!" So there were about 15 SAPOs in our parade and we made our rounds all over Ayacucho. Leading the pack was a 1968 model volkswagon, and we all followed doing a three toot horn salute...one calls and the others are to answer. I rode along with Roberto in his red SAPO. After the parade Milagros invited me, along with Sara and Kelsey (two other volunteers) to her house for lunch. I didn´t know this at first, but all the bags were a sort of ¨campo exchange¨ kind of like bartering. Mama Milchora, Celia´s mom, does not sell any of her potatoes, meat, or cheese. When the kids come from the city they bring things like pasta, sugar, rice, and fruit and they leave it with Mama Milchora in Remiapata. 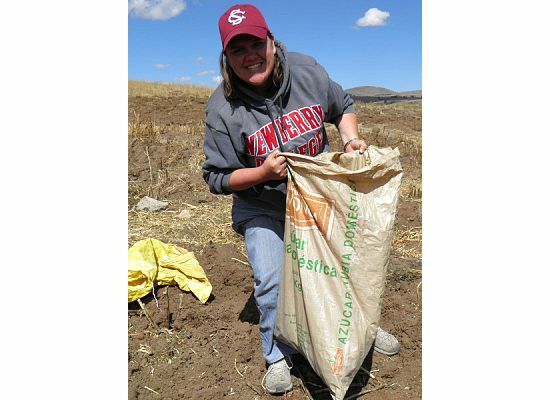 She in turn fills their bags to return to Ayacucho with potaotes, homemade Andean cheese, fresh milk, herbs, and meat of a cow or sheep. This is how the campo works. The honest trading to get what you do not have or need. It really sort of helps illustrate a form of partnership too; what can we do better together, than apart. So when we arrived there were these fabulous smells coming from the rustic little kitchen house. I (of all things short) had to crouch down to get in the door. It is customary in the campo to have a hearty breakfast before going out to the chakra to harvest potatoes. 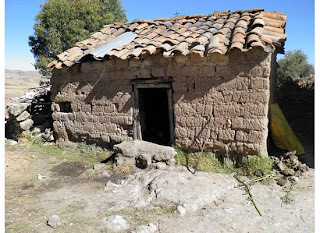 Mama Milchora had prepared a breakfast of boiled fava beans and corn, hard boiled eggs, potatoes and fresh Andean cheese. Be sure not to fill up on all that, because those were breakfast appetizers. Next, was the hearty occa (like a cross between an apple and potato) soup and camomille tea made from the real flowers picked out back. I am not so sure how one is supposed to work after eating all that. I was tired and weighed down, the rest were raring to go. They kept saying ¨Eat up, Lisa.¨ Armando and Carlos headed out to the Chakra early, Irma and Luz headed to where the sheep were. Mama Milchora and I stayed at the house to milk cows and have her teach me how to make fresh Andean cheese (a.k.a fresh but unpasturized). 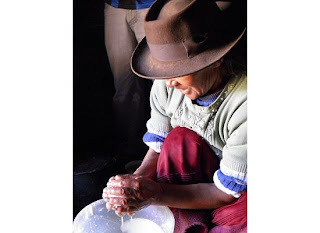 Milchora had Sally and Brunsa the cows milked in no time flat, and brought the milk to the kitchen where she dumped in a little smidgen of her ¨cultures¨from a plastic pitcher hanging on the wall. She put the top back on the milk bucket and we waited. Milchora makes a molded cheese using woven straw straps and a bowl for the mold, as well as hand hewn patties of cheese. I ate more than my share of this cheese this weekend. It is fresh, salty-after its bath, and cold even though never refrigerated (Huh!?). When Milchora and I had gathered some rations for lunch (i.e. the rest of the breakfast appetizers (favas, potatoes, and cheese) as well as some fruit and a liter of lemon lime soda we headed across the valley to the chakra or land where she cultivated potatoes. We were lead by the dogs and the cattle (remember Sally and Brunsa - they gotta eat). The cattle hung out on the outskirts of the potato field munching while we (the 6 of us) harvested the rest of the potatoes and occa that were still in the ground below the already harvested fava plants. The sun was horid and beat down all day. It was quite warm. That was just an inkling of the temps that were coming as the sun went down. We took a mid day break for a snack of favas, cheese, sprite, and potatoes. I sort of wanted to wash my hands, and while looking at them, Mama Milchora said ¨We do not wash our hands out here, we all came from the dust and that is how we will return!¨ How biblical. I was only slightly enthused, but hungry so I ate. When we had finished collecting all the potatoes and occa, we had to get the bags back across the valley without tractor or truck. I was hoping the cattle would help, but they were not interested. So 100 lb sacks were loaded on backs and away we went. I went back to the house and Luz and Milchora set to work making a hearty soup of veggies and milk. NICE. It had already started to cool off, but that was only the begining. It gets frigid this time of year in the Andes, when the sun goes down. After supper we all sat around talking while seated on the log bench in the kitchen and realized it was time to get some sleep. Beds or Andean sleeping bags in Remiapata are sheep skins on the floor with multiple blankets on top, plus many layers of clothing. I was snug as a bug in a rug! It was soooo cold outside of my little sheep skin cacoon I had built. We all slept in one room, like a big Andean slumber party. Sheep skin rugs everywhere, and no bathroom...only nature. Sunday morning I awoke to Armando, Luz, and Irma slaughtering a sheep the girls had brought back. EVERY part of that sheep would be put to use this day in Remiapata. Lunch/Brunch was going to be more potatoes but also caldo de cordero or sheep meat soup, sangracita(potatoes and blood and something else mixed and boiled), and chicharrone de tripe or fried sheep intestine. Not bad. Very conventional in the Andes. The skin and the legs of lamb were laid out in the sun. The legs would later find their way into each of our bags to take home. After the slaughter Armando poked his head in the kitchen and said¨Did you hear? Celia gave birth last night. It is a girl.¨ So we all passed the cell phone around the yard. 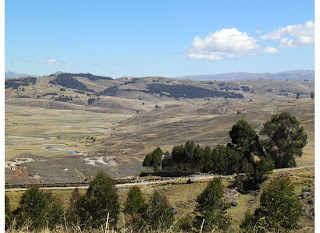 I wasn´t in Ayacucho for Izzy´s arrival, but I was in the next place cooler...Remiapata. So that is Remiapata. I know there is much more to this colorful landscape, but this is only my first trip. There are about 12 families that live there. There is a cemetery which is where Celia´s father is buried. He was one of the ¨disappeared¨from the internal conflict or violence of the 80s and 90s. He disappeared about 26years ago. His remains were found in communal grave two years ago. Luz, the youngest child at 27, told me that she was only one when he disappeared or was kidnapped. She never knew him or never had the chance to know him. It was time for lunch, but it was also time to go. Armando had secured a ride for atleast two of us in a truck, the rest would end up waiting a few hours. So Mama Milchora put a lump of sheep meat from the soup in my hand and said ¨You gotta eat!¨So walking up the driveway I was gnawing on a sheep shank. We got to the truck and whatta you know? The driver was Wilber. I know Wilber, and he recognized me, from Paz y Esperanza. Wilber is the President of the Victims Association in Huarapite, whom we worked closely with to support them in the Sepillio Digno back in April. The truck was loaded with potaotes headed for Ayacucho, but there was room for two more and our stuff. So away we went. It only took us an hour and half to get home to Ayacucho. It took two and half to get to Remiapata. No comment. I have been living in a Quechua speaking region for almost 10 months now. I have mentioned this language and its people alot in my blog entries so I thought I would give you a little glimpse into this language. The Quechua speaking people are the indigenous people of Peru, and distant decendants of the Inca. First, I am NO WHERE fluent enough to carry on a full conversation, but I understand alot more than I speak. 1. Quechua is generally a spoken or an oral language. It is not usually written down. That makes it even more challenging because you have to pay close attention to pronunciation. 2. The mamás (what the women call one another) are endeared to me and so proud when I can remember what they taught me the week before. 3. There is NO ¨O¨ sound in Quechua. It is usually replaced by an ¨u or oo¨sound. Like Franco the little boy that lives in my house is actually Francu or Francucha, instead of Franco. 4. When there is not a Quechua word for something, generally the spanish is used. That happens alot in the church, both Catholic and Protestant because one was brought by Spain the other by North Americans and Dutch Missionaries, no Quechua there. 5. Quechua is regional. So even within Peru, there are probably three or more dialects and vocabularies. For instance Cusco versus Ayacucho. Also Quechua culture is practiced and the language is spoken in Ecuador and Bolivia. cuchi- pig Imaynayam Kachkani- How are you? Imaynaym Sutiki - What is your name? What happens at a Paz Y Esperanza GAM session? So all year I have been accompanying the Mental Health Team from the regional office of Paz y Esperanza to the rural communities in the countryside around Ayacucho. While there we work with groups of women (and sometimes men) who have been affected in someway by the violence and internal armed conflict. Many people have asked me what we do in those groups. They are meant to provide a safe space for the affected people to learn about links in physical and mental health, support one anotherand walk in solidarity, process grief and feelings, as well as build a support network that will continue after we leave. I thought I would give you all a glimpse into what one of these sessions looks like. First is location. In Loricocha we have been meeting at Mamá Rosalinda´s house, and in Cangari they have a community building up near the Catholic Church. Next is language. Most of the people victimized by both the Sendero Luminoso (The Shining Path) and the Military´s counter insurgency where Quechua speaking people, therefore most of the people in our groups are Quechua speaking. Some of them speak both Quechua and Castellano or Spanish. Bye the way the spanish spoken in Peru is not Castillian Spanish, but they call it Castellano for giggles. 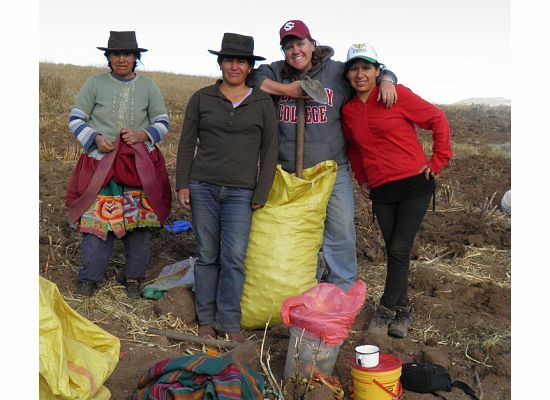 The team utilizes Quechua though because for most of our groups this is their native tongue. So this is what the fourth of eight sessions looks like. First there is a welcome and check-in to share feelings and what they have been doing and what has been happening in the community done by Milagros or Yudy as we gather in a circle. Then there is some sort of dynamica or icebreaker. Perúvians love a good icebreaker. The Cangari folks love to dance around. Next, while in the circle, Yudy, Milagros or I will talk about negative feelings and that sometimes we have these. That negative feelings, like sadness, resentment, furiosity, and anger are part of our being human. We then open up the circle for the women and men to share some of their negative feelings and if they want to (usually they do) when they have felt these. The sharing is usually followed by some exploratory reflection. Then Milagros leads a group reflection. There is a reflection and exploration process after just about each component of the worshops or sessions. This makes things more than fun and games, but a place to begin processing feelings and memories. A place to start in moving from being a victim to a survivor of atrocities and events that happened 27 years ago. Some of the questions that guide this reflection of the puppet socio-drama are ¨What happened in the story?, Where did solidarity and support exist in this story?, and How can you help en a case of pain, suffering like what happened in this story? The focus is confronting difficult situations, expressing feelings, and gauging solidarity and support within the group. This is important because we have 8 sessions together and then the group is to continue meeting on their own, utilizing the support and care skills they already had and the ones we explored together. The PyE Mental Health team does bi-annual follow-up visits with these groups. To close out the session we engage in a group ritual. Each member writes down or illustrates their negative feelings or things they have holding inside on a small card. Then outside a small fire is lit, and as they leave they place their card on the fire as a symbolic way of expressing but also relieving some of their negative feelings, symbolizing leaving these feelings, and starting a new stage of life. Milagros, Yudy, and I accompany this ritual with words of hope, about mood, and to lift self esteem, but also about the feeling to work through this stage and leave it behind, inorder to begin a new one. Finally, the session is closed out with each member checking in about how they are feeling. Then each member comes forward and makes a knot on the quipu signifying their attendance at this session. A quipu is an ancient Incan counting tool...a length of rope and various knots were used as a means of counting things like crops. It is much like a rope abicus. Then we all share a communal meal that both the people and the PyE Team has brought elements of. Want to Support Lisa this Year? I would be honored to have you pray for me while I am in Peru. Please pray for my safety, the people of Peru who will accept me into their homes, churches, and hearts, and for my family and those who will miss me (and I them) while I am gone. Finally, if you would like to make a contribution to help me reach my fundraising goal of $9,000 please click on the link below and find my name listed under Peru. http://gamc.pcusa.org/ministries/yav/support-yavs/Your contribution, no matter how big or how small will go to help with airline travel, visas, and a small stipend for food and travel while I am living in Peru. If the US Postal service is more your style send a check to - PC(USA) P.O. Box 643700 Pittsburgh, PA 15264-3700please put my name and ECO # - E210801 in the memo line. Lisa is being sent by the General Assembly Mission Council of the PC(USA) to serve as a Young Adult Volunteer (YAV). Leaving in august of 2010 and returning in August of 2011.